James had the better first game. Back in 2004 I took him to his first Blue Jays game. We won big that day, I caught a foul ball and future Maple Leafs GM Brian Burke was sitting only two rows in front of us. Today Michelle got to her first game and she had to endure another power outage as we lost 7-4. There were some good things that happened at the ballpark formerly known as SkyDome this afternoon. 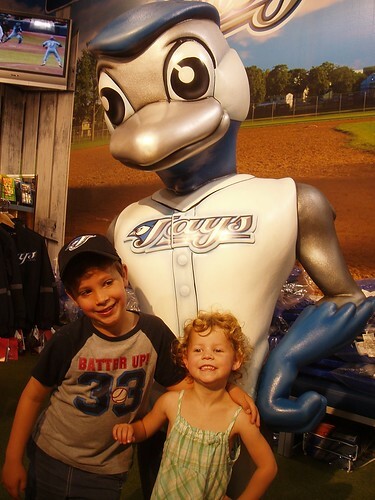 The kids got to watch the roof close, I got a BBQ apron, we almost caught a foul ball (off the bat of Gregg Zaun) and I bought a new retro Jays logo ball cap. Watch out, world. Here are a few bonus notes from my afternoon at the dome. Reed Johnson is an energy player who took it to us all weekend. He had a couple more hits today and scored a couple of runs in the leadoff spot. He'd make a great Jay. Fukudome's name made me giggle all game. We're in a dome and all I read was fuk-u-dome. What happened to Diamond? When they gave BJ Birdy the boot for no good reason, they crammed Ace and Diamond down our throats. Now, it's just Ace. Is Diamond okay? Has anyone heard from her? The best part of the game, of course, was hanging with the kids on Father's Day and seeing the game through their eyes and answering their 101 questions. Here's the photoset from our day, including plenty of shots of the roof closing. Fuk-u-dome reminded me of Austin Powers, Fuk-u and Fuk-me. ba ha ha!! I too wondered what happened to Diamond. Maybe she ran off with the Philly Phanatic? Sigh...just give us BJ Birdy back!